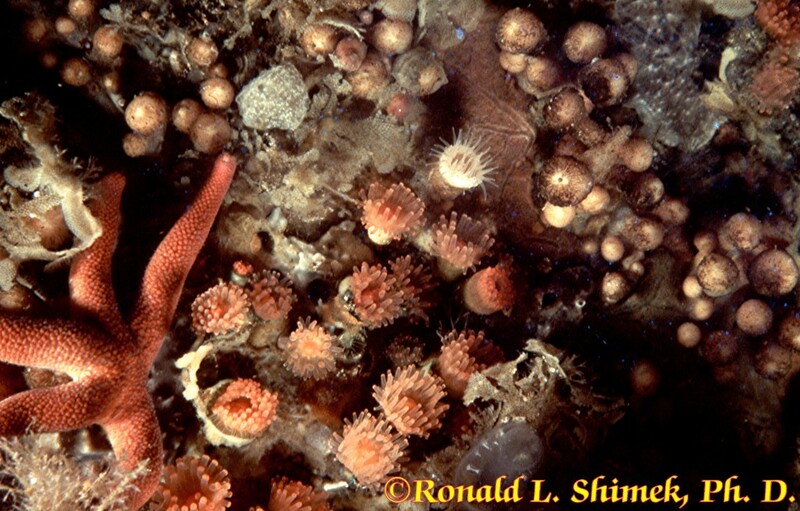 ﻿ Cold Water Stony Corals Are Common In The NE Pacific. The orange cup coral grows slowly. The nematocyst batteries on the tenacles are very evident. Recently, I have written quite a bit about many temperate and cold water animals, some of which would, could, or should, make beautiful additions to an aquarium having the appropriate conditions. Aquarists interested in coral reefs have probably noticed the absence of stony corals in my discussions, and probably thought that was because there were no stony corals in the region. While shallow-water reef-forming corals are not present, recent discoveries have shown that there are vast reefs of deep-water corals. These reefs and the animals that populate them are so new they are essentially unknown to science. It has only been in the last 20 years or so that many of them have been found, and their deep water habitat, generally they are found well below 300m (1000 ft), precludes any easy studying. Additionally, there are also huge populations of some beautiful solitary small cup corals. Lacking zooxanthellae these corals grow very slowly, and do not form reefs. Nonetheless, they are easy to maintain in captivity, and at least one species is quite easy to find and collect. In some areas they are found on just about every rock that is found in an area, and while they don’t form reefs, their cumulative biomass in a given area may be quite large. I know of four stony coral species found in the region, one is very common, two are less common, but not rare, and one that is exceptionally rare (found only in one locality that I know of). Only the orange cup coral has a common name, the others, although abundant in some areas, simply haven’t been seen by enough divers to have picked a common name or two or three. All of these corals probably feed on the abundant zooplankton of the region, probably copepods or cladocerans, but their diets are largely unknown. In an aquarium, they probably would eat anything that is meaty. 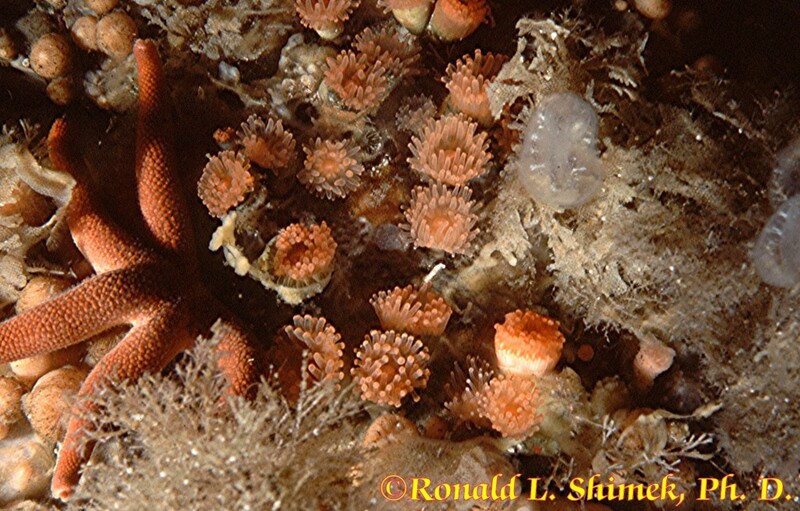 Balanophyllia, a coral genus with over 60 valid species, has representative found in virtually all seas from the Arctic to the Antarctic, and including the tropics. Several species are found in the Indo-Pacific, and are often recognizable in photographs taken in caves or shaded ares. Nevertheless, while the odd individual finds its way into the aquarium trade, this is a rare occurrence. In contrast, Balanophyllia elegans, the yellow or orange cup coral, is almost ubiquitous in the shallow waters of the NE Pacific having a rocky substrate, and this includes some areas with relatively low salinity. The biggest individuals I have ever seen were a shade under 25mm (an inch) in diameter, and most are smaller. They are very slow growing animals; measured growth rates indicate a maximum growth rate of about 1 mm in diameter per year. They disperse slowly, generally the female broods the young, while they develop to the planula stage, after which they crawl away from her. In most cases, they appear to metamorphose within 10 cm (4 inches) of the mother. A group of orange cup corals, probably all of the smaller ones are offspring of the large individual. Paracyathus stearnsi and Caryophyllia alaskensis require fully saline waters, and are thus found mostly in outer coast areas or in deeper habitats in inland waters. Paracyathus stearnsi individuals are larger than those of Balanophyllia elegans, reaching more than 30 mm (about 1 1/4 inches) in diameter. The corallite is conical, and very narrow at the base. As it grows its diameter rapidly increases, giving the coral an almost ice-cream cone shape. This contrasts to B. elegans whose corallite is almost cylindrical. Paracyathus stearnsi is tan to brown with the oral disc often being a deep chestnut in color. Caryophyllia alaskensis is found in deeper waters and is rather uncommon. It is often pink and it is about half the size of Paracyathus stearnsi. Virtually nothing is known about its natural history, other than it exists. 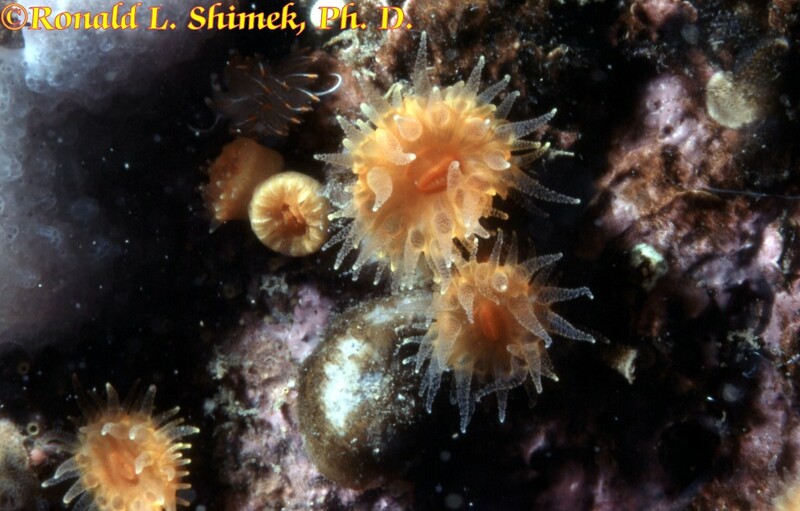 Given the moderate size of these animals they probably could be described as being LPS corals. The tan or brown Paracyathus stearnsi individuals are the largest polyps from the shallow water corals of the Pacific NW. The ice cream cone shape to the corallite of Paracyathus stearnsi is evident. The oddest stony coral in this region is Labrinthocyathus quaylei. 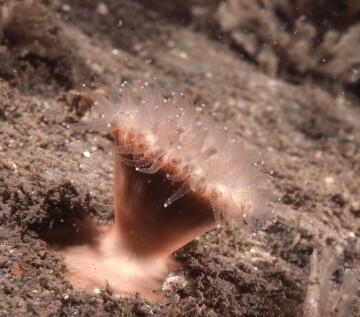 The polyps are reminiscent of B. elegans, but the color is slightly different being a pinkish orange, and a bit smaller, about a centimeter in diameter. They are distinguished from all other corals on this coast by often having two, or more, polyps arising from the same base. 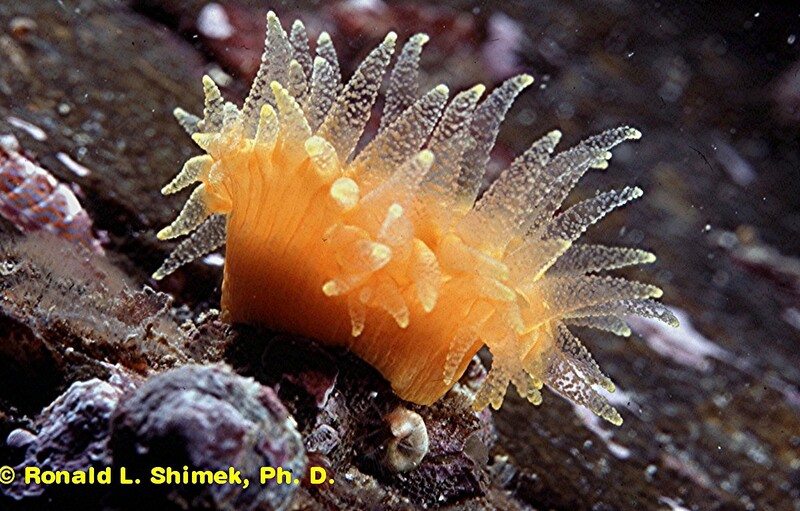 As far as I know, they have only been seen once in this region, in Barkley Sound, at a depth of about 25 m. Obviously they are elsewhere, but nothing at all is known about them. Labrinthocyathus qualeyi, showing a couple of twinned polyps arising from one base. The rare branching coral from the outer coast of Vancouver Island, Labrinthocyathus qualeyi. 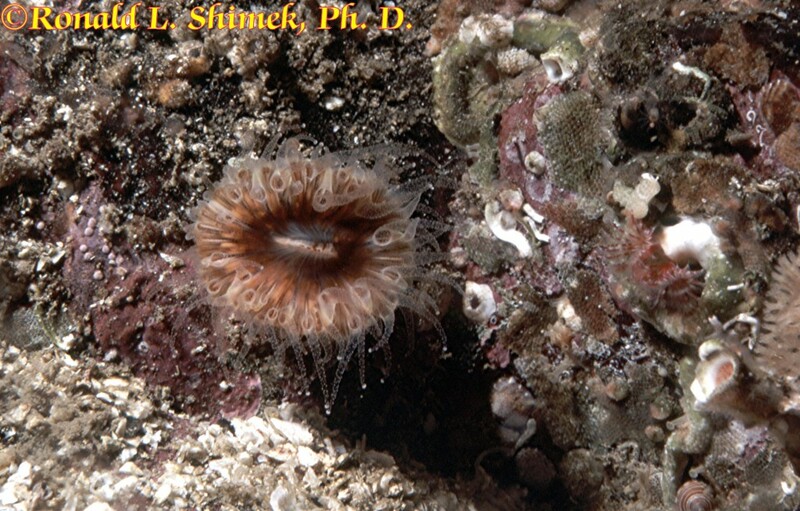 White polyps of the zoanthid, Epizoanthus scotinus are visible here, as well. 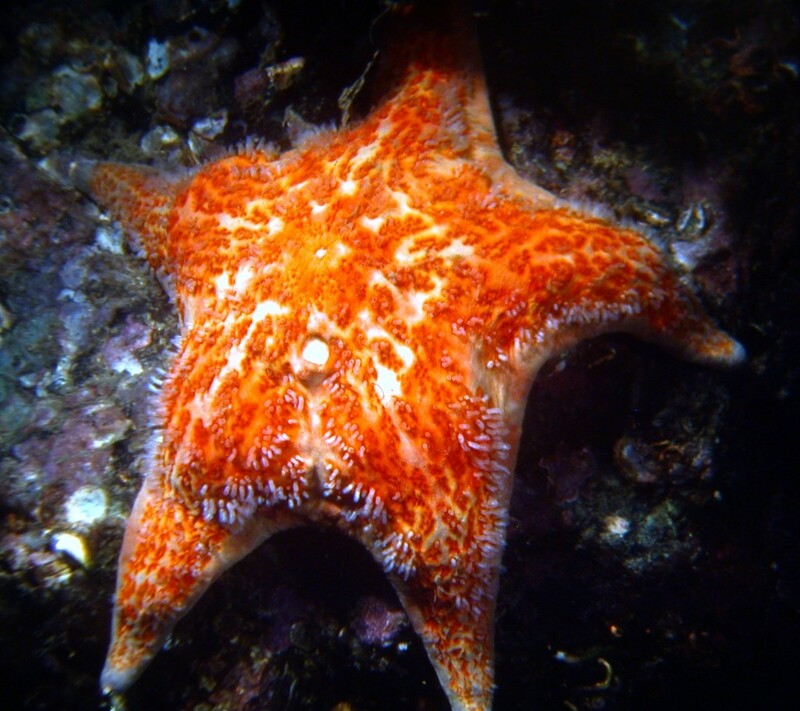 The north Pacific sea star, Dermasterias imbricata, is a predator that specializes in eating sea anemones, corals, and soft corals. Any of these animals would make beautiful additions to a cold water tank. All corals, and anemones, from this region would be at risk to the leather star, Dermasterias imbricata, which eats anthozoans of all kinds. This predator cannot be maintained with them, and one shouldn’t try. However, no other predators are likely to cause the corals much grief.